A group of observers, established in 1953 when a ceasefire was declared in the Korean War, still monitors the truce's validity, mainly from the peninsula's four kilometer-wide Demilitarized Zone. However, some of its attention has shifted to the disputed western maritime frontier. As a result, Sweden has sent the former head of its navy to lead its delegation at the Neutral Nations Supervisory Commission. In the 58 years since its inception at the Korean armistice, the Neutral Nations Supervisory Commission has downsized. Originally composed of 400 officers from four countries which did not participate in the war here, its only permanent composition now is five Swedish and five Swiss officers. Poland also sends over a few personnel to visit from Warsaw several times a year. "I think if my government, back in the 50's, would have known what they were going to spend here for the coming 60 years they wouldn't volunteer so easily as they actually did," said Rear Admiral Anders Grenstad, who is heading Sweden's delegation. It was assumed in 1953 that peace talks would lead to a treaty and the truce supervisors could return home in a year or two. Instead, the two Koreas, technically, remain at war. And, the NNSC is still in place to monitor the truce and gauge whether military movements and exercises comply with it. The United Nations Command Military Armistice Commission also has a monitoring role, investigating serious incidents, and is supposed to participate in any relevant negotiations. But the demise of the communist bloc in Eastern Europe in the 1990s meant the end for the NNSC delegations from Czechoslovakia and Poland who represented Pyongyang's side. North Korea blames the United States for destroying the NNSC's neutrality. According to the North, the continued presence of the Swiss and Swedish officers at Panmunjom is "a poor charade." 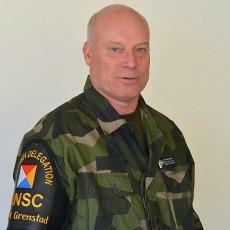 Despite the setbacks, Admiral Grenstad says the NNSC's remaining components persevere. "It's sad that we don't have a body that works on both sides," he said. "Sweden, Switzerland and Poland, we will keep on doing this job according to the armistice agreement as long as we are needed here. And I think it's good, both for the North and for the rest of the world that there is a neutral and impartial body here supervising the armistice agreement." A scene reminiscent of the Cold War era still plays weekly in one of the three blue conference houses straddling the two Koreas. The Swiss and the Swedes sit down on the northern side of the line in the Joint Security Area at Panmunjom. They prepare a summary of their weekly meetings for the North Koreans. "These documents, signed then by the Swiss general and by me; we open the door to North Korea, we wave with the papers and show 'we have mail for you' and we put it in the mailbox," he explained. "They must have a very lousy mail service over there because they never get their mail. But they know it's there if they want to read it. So, of course, they're sending the signal to us: "We don't recognize you." Some of the commission's attention has shifted to the coastal waters off the western Korean coast. The sea is not mentioned in the armistice. The maritime Northern Limit Line was observed by Pyongyang until the 1990s. North Korea now claims a more southerly demarcation line. And that has led to a series of clashes in the waters. The most serious and recent events took place last year. A South Korean warship was sunk, killing 46 sailors. An international investigation concluded the Cheonan vessel was hit by a North Korean torpedo. Pyongyang denies any responsibility. That was followed by North Korea's shelling of Yeonpyeong island, where four people died. The admiral says South Korea's subsequent artillery firings in the contentious waters last November were ill advised. "We did not think it was appropriate in the end of November last year where actually there had been shelling taking place because that there could be a spark, of course," he said. However, Grenstad, whose three decades in the navy has focused on littoral waters, says he does understand that South Korea, having been provoked, wanted to demonstrate resolve to the North and to its own people. But the neutral observer from Sweden says the maritime boundary dispute between the two Koreas can only be settled by political leaders, not by military force.